A c.1810 rosewood davenport with royal provenance from Frogmore House, the stately home in Berkshire which George III purchased for Queen Charlotte in 1792. It is offered for £6750 by Christopher Clarke Antiques. Christopher Clarke Antiques, founded in 1961, is a family business offering campaign furniture and travel items. One of the highlights from its current catalogue, Departure of the 6th, is a c.1810 rosewood davenport with royal provenance. The desk is from Frogmore House, the stately home in Berkshire which George III purchased for Queen Charlotte in 1792. Offered for £6750, it is believed to be the one illustrated in an 1817 aquatint of the Queen’s Library. Aside from its royal provenance, it is catalogued as an “exceptional, well drawn piece of furniture… for a Davenport it can perhaps be considered small and it is neat with clean lines”. Measuring 2ft 10in (86cm) when closed, it features the original tooled leather skiver to the writing slope. 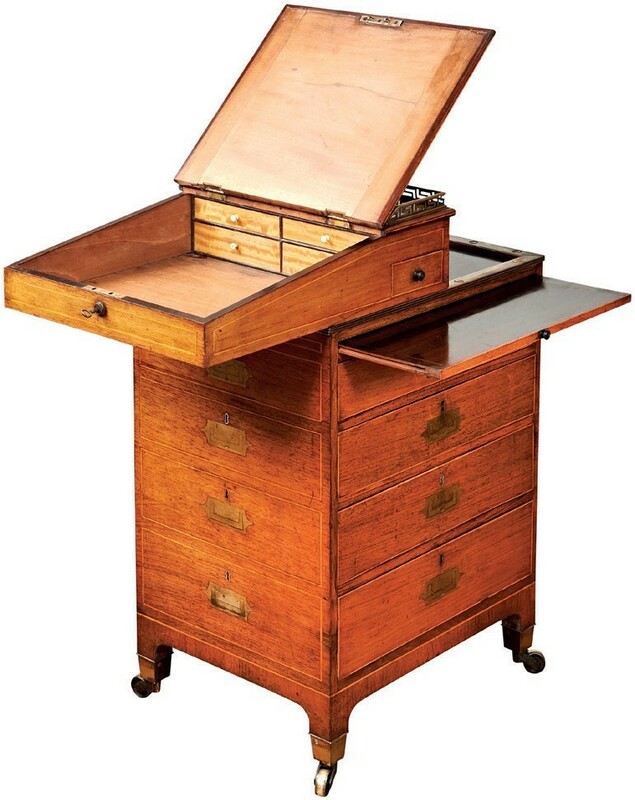 It also includes a top section which slides forward over the knees, a storage space for documents, and brass casters on which the whole desk can be easily moved. The catalogue is available to order for £15 from the Christopher Clarke website. 17th century Ottoman calligrapher’s pen box, offered for £25,000 by Kent Antiques. 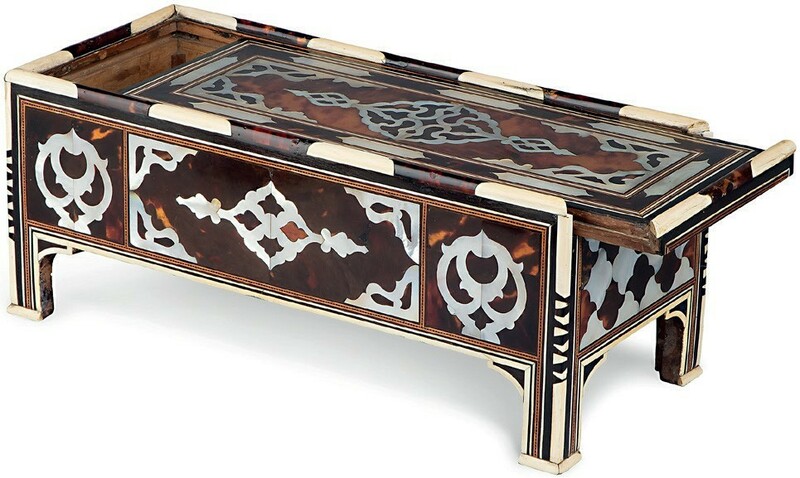 A rare 17th century Ottoman tortoiseshell and mother-of-pearl inlaid calligrapher’s pen box from Turkey is among the stand-out offerings in the latest catalogue by Kent Antiques. The London gallery offers Islamic and Indian art, specialising in courtly objects and works of art. Measuring 13½ in (34cm) long, this box is offered for £25,000. A silver and ivory clock by Cardeilhac, made in the shape of a lyre after a model by Lucien Bonvallet. It is offered in excess of €50,000 by Tobogan Antiques. French dealership Tobogan Antiques offers this rare silver and ivory clock by Cardeilhac made in the shape of a lyre. It includes seven gilded silver titmouse birds, boughs of holly with berries of amber and a ribbon. The piece, which is offered for a price in excess of €50,000 in its latest catalogue, Second Empire, was made after a model by Lucien Bonvallet (1861-1919), who showed it at the Paris Exposition Universelle in 1900. Cardeilhac specialised in cutlery and flatware throughout the 19th century. It was awarded a gold medal at the 1878 Exposition Universelle, giving the company an unprecedented sales boom. The designer, Bonvallet, exhibited his works at Cardeilhac’s stand in 1900 and at the Salon d’Automne of 1919. Many of his works are now on display in the Musée D’Orsay, the Paris decorative arts museum and the Bouilhet-Christofle museum. 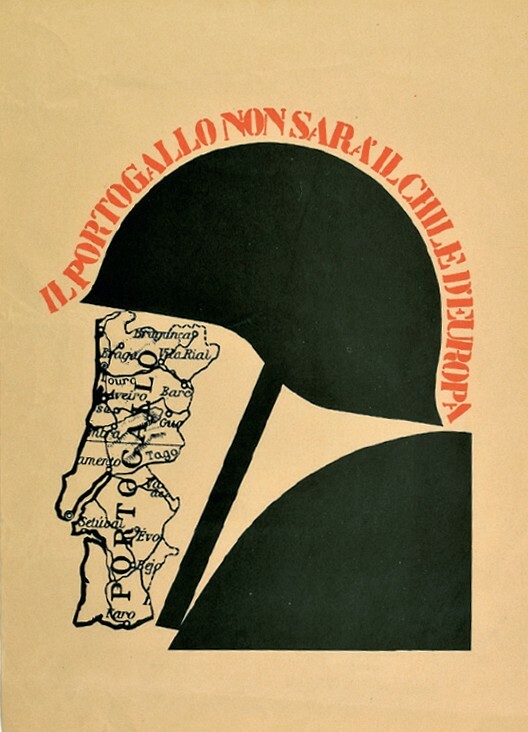 A Portuguese socialist protest poster produced following the Carnation Revolution of 1974. It is offered for £650 by Altea Gallery. The latest catalogue from Altea Gallery, a specialist in antique maps, sea charts, atlases and globes in London’s St George Street, focuses on pictorial and satirical maps. Offered for £650 is this socialist protest poster of Portugal produced following the Carnation Revolution of 1974. It depicts the head of a soldier wearing a helmet, his face made from the map of Portugal. Above him is the anti-fascist slogan Portugal will not be the Chile of Europe, used during the movement that overthrew the authoritarian regime of the Estado Novo in April 1974. The poster expresses the hope that the regime change would not emulate Augusto Pinochet’s coup of 1973 in Chile, which featured a thousand executions in the first six months, the abolition of civil liberties and 500% inflation in the first year. A Chinese school view of Canton from c.1885. It is offered for £30,000 by Martyn Gregory. This unusual bird’s-eye view of Canton, completed by a Chinese artist in gouache c.1885, is a departure from more familiar ‘hong paintings’ initiated a century earlier. 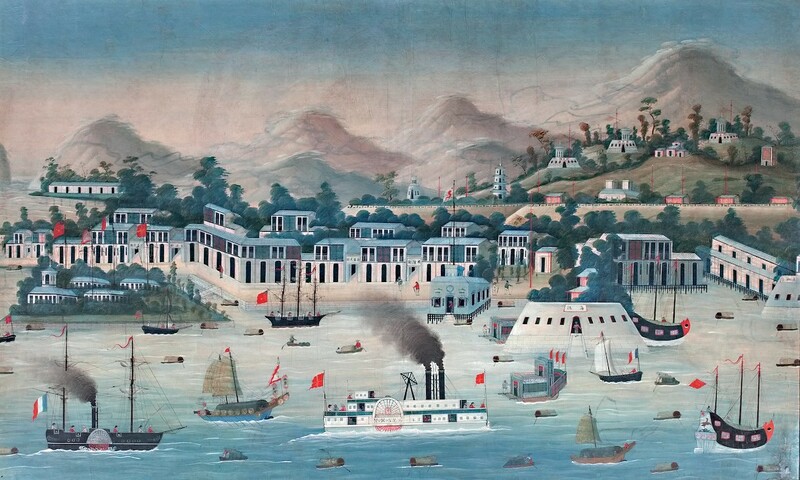 The western ‘hongs’ or factories had been destroyed in 1856, with the result that the foreign merchants established themselves firstly on Honam Island across the river and then on the reclaimed island of Shamian seen on the left. By this time, the long-standing prohibition against Western ships coming up to the city had been relaxed and steamers and a three-masted sailing vessel is visible. Several landmarks are denoted in Chinese characters, an indication that the picture would not have been produced purely for the Western market. The picture, offered for £30,000, is included in Martyn Gregory’s 2018-19 catalogue Merchants and Mariners: Historical pictures by Chinese and Western artists 1750-1970. A silver coin from Metapontum c.430-400BC. It is offered for SwFr4300 by Cahn. Cahn’s Quarterly is as much a newsletter as a catalogue. While it includes an assortment of the items the antiquities dealership in Basel, Switzerland, has on offer, it also features several pages of editorial content. The most recent edition, for example, includes essays on the role of the coin in the ancient world and the history of photographing of ancient sculptures, as well as news of the gallery’s experience at recent fairs. This stater, made c.430-400BC, is from Metapontum, one of the ancient Greek colonies that occupied modern-day southern Italy. The silver coin measures 1in (2.3cm) across at its widest point and shows to the obverse the head of Demeter, goddess of the harvest. To the reverse is a naturalistic ear of barley with the inscription META. It is available for SwFr4300.